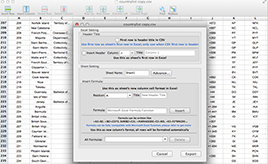 Edit and convert CSV with text encoding type detecting. Detect CSV file encoding type automatically. Don't worry about your CSV file even you can not know it. Support almost all of text encoding type. Support CSV delimiter setting to be used for different CSV files. Cut, copy, paste, add, remove, move row and column easily. Fill and merge text. You can fill any more expected text to multiple fields at a time, this will improve your editing efficiency and save your time. You also can merge multiple fields to into one field text at a time, this also will improve your editing efficiency and save your time. Adjust column text alignment easily. Special row and column editor. There is a special row / column editor, if you don't like to edit CSV in main table editor, you can use it. This makes CSV Editor app so much more convenient to edit your CSV documents. Support different column number in each row. Multiple lines view and input. 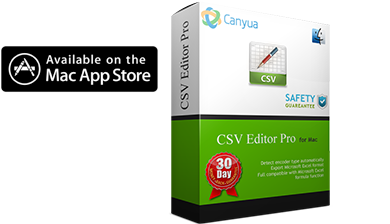 CSV Editor do very well for row with multiple lines text, you can easily view, edit and input multiple lines text. Align text. You can adjust text alignment for each column, this will be very useful for viewing or printing CSV. Multiple select rows. You can easily select multiple rows to do what you want. Export as Adobe PDF format. Print CSV file easily. You can easily print CSV document with customized margin space, grid line and page number. Export as Microsoft Excel. 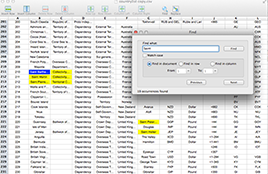 You can use customized rows selection to export, create multi sheets in Excel file, insert Microsoft Excel formula if you need report statistics, full compatible with Microsoft Excel formula function. 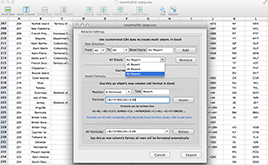 Export as Microsoft Excel format easily at any time. Insert header title. You can set header title for each column. Add formular. You can set Microsoft Excel formula for any column if you want to report statistics for it. You can assign row range to create multiple sheets in Microsoft Excel file..
How to edit CSV file ? How to export as Microsoft Excel and create multi sheets in Excel file ? Ultimate solution for all your CSV needs.